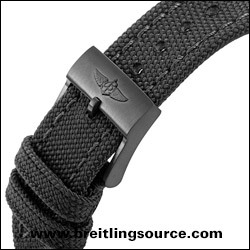 The Breitling Miltary strap is a canvas strap availabe in at least two colors, Black and Olive Drab Green. It features primarily Canvas construction and a soft leather backing on it in black leather to improve the feel on the wrist. The leather on the back of the strap is marked similar to the way the leather straps are marked. Introduced around 2014 and used initially on a lot of Blacksteel models.